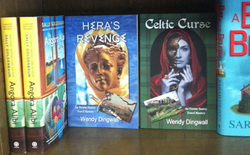 Boone resident and CEO of Canterbury House Publishing, Wendy Dingwall, launches her debut novel, the first in a series, Hera’s Revenge: An Yvonne Suarez Travel Mystery. The public is invited to meet Ms. Dingwall at Barnes & Noble, 3 South Tunnel Road, May 5th from 5-7pm. In Hera’s Revenge, when an airport employee turns up dead in baggage claim upon their arrival in Athens, the Pinkerton Travel group gets off to a rocky start. Yvonne’s corporate client, David Ludlow, needs a vacation from his stressful job, and this itinerary in the land of mythology, Greek philosophers and early democrats is just the ticket to a leisurely escape, until grumpy passengers, missing museum art, and deathly accidents plague their journey. A reluctant sleuth, Yvonne, pulls out all the stops to keep her clients safe and her tour on track. Wendy Dingwall operated her own travel company in South Florida for over 12 years. In 2001 she moved to the mountains of Northwest, North Carolina and after phasing out her travel business, began working for a local book publisher, marketing authors and their books. In July 2009 she opened her own publishing company and by fall of 2011 will have published 15 books by various notable southern authors. 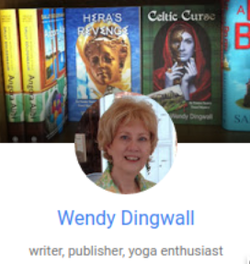 Shortly after arriving in the mountains and inspired by the writing community there, Dingwall started writing her first mystery, fulfilling a lifelong dream. She is an active member of High Country Writers and co-founder of a small writing critique group. She continues to work on the second and third novels in her mystery series featuring amateur sleuth, Yvonne Suarez. Hera’s Revenge is available nationally in bookstores and online retailers as of April 1, 2011. Canterbury House Publishing, Ltd. ISBN: 978-0-9829054-2-5, trade soft cover, $14.95. For more information or directions to the book launch contact: Barnes & Noble, (828) 296-7335. Hera’s Revenge is the first in a murder mystery series featuring amateur sleuth, Yvonne Suarez. The first mystery takes place in Greece and the Greek Islands. Yvonne leads a small tour group, and when mysterious accidents occur along the way, she must find the strength to face what is happening, figure it out, and keep her travel clients safe and their tour experience on track. While this is going on she struggles to keep her emotions under control, she’s attracted to a tour customer, and she worries about her young daughter who has never been separated from her more than a few hours. As do most authors, I wanted an unusual protagonist. Yvonne takes characteristics from one spunky Cuban travel agent I know, and another, more reserved under pressure agent. This allows for some inner struggles and growth. Well, it’s that old adage, write what you know. I owned a travel agency, and worked as an independent agent for a large travel agency chain for several years. However, the main reason was the wide scope for settings and situations that it gave me as a writer. Another thing that appealed to me was that in recent years, with heightened security and hassles at the airport, and the economics around the globe, people are reluctant to travel, so I thought this would be a way to offer readers the thrill of traveling without leaving the comfort of their own homes. When I was in elementary school, I loved creative writing and was encouraged by teachers to become a writer. When I came home from school one day and told my mom that I wanted to be a writer when I grew up, she responded by telling me that writers often starve and it’s very difficult to earn a living. That caused me to put writing the great American novel on the back burner. In my professional life, I wrote press releases, ad copy, and occasionally when in the mood, I’d write a poem. Writing a murder mystery was always in the back of my mind. Then, I read a travel mystery, which I didn’t care for. I thought the characters were stereotypical and shallow, and thought, I’d like to see if I could do a better job at it. At the time, I had just gotten involved with the High Country Writers group in Boone, and found the encouragement I needed to get started. It took me 7 years, writing in my spare time to get through the first 4 drafts, but I finally did it. With my first book, I did a lot of thinking about what elements and themes I wanted in the story. From there it pretty much evolved from the characters. I chose to take the tour to Greece because of the history and mythology that I could weave into the storyline and hopefully, the travel scenes would allow the characters to excite the interest of the readers. With my second book, I new I wanted to go to Scotland, but I got the idea for the mystery from a paranormal program I’d seen and decided to weave some paranormal elements into my second novel which takes place in Scotland. In that novel, Yvonne is on a familiarization trip, and is helping a woman find out what happened to her brother who disappeared 40 years earlier, a cold-case mystery of sorts. In the beginning, I wrote mostly long hand. Once I began typing the novel to a word document on the computer, I found it much easier to write that way. I will still jot a scene or a sentence long hand if I’m away from the computer, but when I’m seriously writing, I’m sitting at the computer typing in the zone, in a Word document. My goal is to become more regimented in my writing. I’m still writing sporadically because of my work schedule. If I knew I could carve out a certain amount of time each day and stick to it, I’d be thrilled. It’s the best way to keep the enthusiasm and energy going toward completion of the book. Though I believe my craft as a writer has improved, I think it’s important that as writers we continue to be open to our critique groups, and editors, and to continue to hone our writing skills. My favorite southern saying has to be: Ya’ll come back now. My favorite southern food would be the fried green tomatoes at the Grove Park Inn in Asheville, NC. And, my favorite southern character is without a doubt, Scarlett O’Hara in Gone with the Wind, she epitomizes the beauty, brains, charm, and strength of a southern women. I live about 10 miles due west of Boone, North Carolina in the high mountains of the Appalachian Trail, the Blue Ridge Mountains. I live with my husband, Walter, our 2 Maltese rescue dogs, Tallulah and Sasha, and 1 cat, Katrina. We live on 50 acres that once was a Christmas tree, and later, a tobacco farm. From my home office window, on the second floor, I have a spectacular view of the Bethel valley and the Virginia Mountains, as this window faces north. From there, I watch everything from deer, to ground hogs, to turkeys meander through our front yard. My favorite story is about our childhood cat, Red. We swore he had nine lives. Once, we were called next door to the neighbor’s house to retrieve him from our neighbors best cast iron skillet set out on top of her gas stove, where he had fallen fast asleep. Another time my sister, Pat, and I decided we would cure, Red, of a small patch of mange by putting medicated Dermassage all over his hairy body. By the next day, we had a hairless cat. Another time, my mother arrived home from work to find our grandmother digging a whole in the back yard to bury Red, he’d been hit by a car and she was trying to dispose of his body before my sister and I found him. After lamenting the details to my mom, she glanced around to show her the body, and found that Red had wandered away, alive and well. My favorite novel as a young girl was Jane Eyre. I loved the romantic, brooding writing. It carried me away to another time and place. I would have to say that I was most entertained and inspired to write mysteries thanks to Nancy Drew, and Mary Stewart, and authors of gothic suspense novels. After I finish with Cailleach’s Curse (my Scottish Travel Mystery), I would like Yvonne to plan a tour for a small group of scientists to a scientific conference where a controversial discovery is a motive for murder. I haven’t yet decided where the conference will be held, I have several possible locations in mind. Check back here soon at our News page for more announcements about Yvonne Suarez Travel Mysteries!